A crowd of more than 500 people came out last night to honor Florence Roisman, Vernon Jordan, Randy Brater and the Fair Budget Coalition at Legal Aid’s 21st Annual Servant of Justice Awards Dinner. The event was keynoted by Skadden partner and former White House Counsel Greg Craig. Mr. Craig reflected on his years of work to advance civil rights and open the ballot box and elected office to all Americans. He urged those present to extend gains in political rights to end poverty and inequality. Florence Roisman and Vernon Jordan received Legal Aid’s Servant of Justice Award. In receiving his award, Mr. Jordan reflected on his early days as a civil rights lawyer and powerfully emphasized the role of legal advocates in bringing about social change. Professor Roisman ended the evening with a moving and powerful call to action. She urged everyone in the room to use their collective power to find justice for people who are homeless, living in poverty, or experiencing discrimination. The evening also honored the volunteer contributions of Randy Brater who received the Klepper Prize for Volunteer Excellence. The Fair Budget Coalition was recognized with the Partnership Award for its effective and persistent anti-poverty budget advocacy in the District. 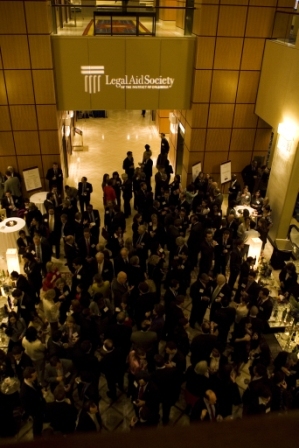 The Dinner raised almost $750,000, nearly one-fourth of the Legal Aid budget. We are tremendously honored and humbled by the support we receive from the legal community and the partnerships we enjoy to bring equal justice to District residents. Many thanks for the wonderful evening go to the Dinner Co-Chairs: Deborah Brand Baum, Pillsbury Winthrop Shaw Pittman LLP, David R. Berz, Weil, Gotshal & Manges LLP, Anne Coffey Proctor, Covington & Burling LLP, and Kurt Richter,Cassidy Turley; and to Legal Aid’s President, Martin Klepper, Skadden, Arps, Slate, Meagher & Flom LLP.